Hello everyone! Looks like we have been having warm February so far. Are you enjoying sunshine? Here are some news for you from us. Our business hours have been changed lately. 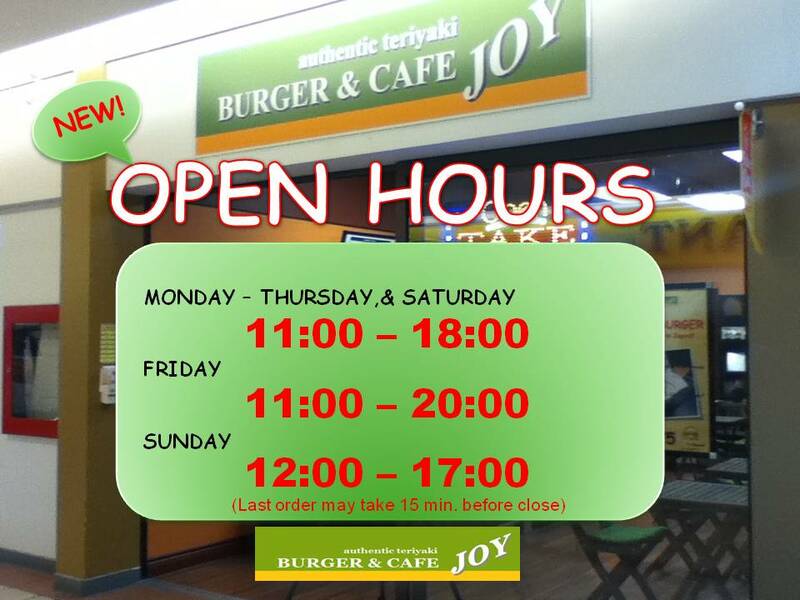 The new hours are Monday-Thursday&Saturday 11:00-18:00, Friday 11:00-20:00, Sunday 12:00-17:00. We hope this could make you have dinner at JOY after your work or school. It has been a half year since we opened JOY in August 8th, 2011. Thank you so much for your generous support all the time. We have now a special offer to the students in Kamloops, as our appreciation. 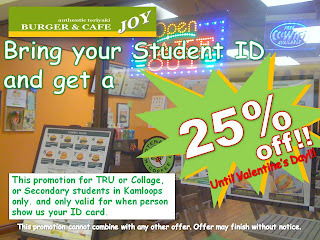 Students with ID can get 25% with any purchases at JOY. It will be good until February 14th. Yes, it is Valentine gifts from us! One more thing to tell you. We have just created our self-produced commercial ad clip. It is just a rough idea yet, it would be grateful if we hear what you think about this. We have even more people coming to us in the last few days. It really appreciated. You make us a good place to eat and to feel cozy. We are very happy to have you as our customer. After 6 months operation, the numbers of the customers have grown and most of them come back again and again! Yay! Hello Vinyl banners. Thank you for liking our web site design. We use "Picture Window" template and customized the background image with our own picture. Are you making your company's blog? Good for you! We will check it out when it is ready.